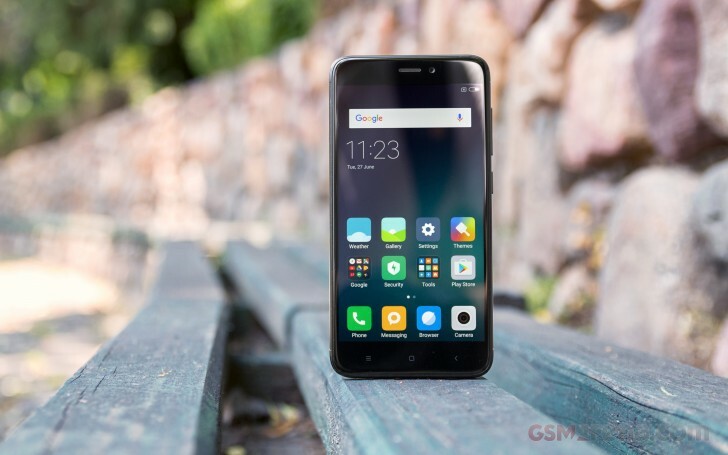 The Xiaomi Redmi 4 is powered by the Snapdragon 435 chipset, one of the more recent iterations in Qualcomm's super-popular 400 series. It's a rather classic setup found in many a midranger in terms of CPU configuration - eight Cortex-A53 cores, in this instance clocked at up to 1.4GHz. Kicking things off with GeekBench, as usual, we observed a bit of an oddity - the octa-core Redmi 4 posts only marginally higher scores than the quad-core Redmi 4a in the multi-core portions of the benchmark. The 4 also lags behind the Moto G5, which packs the older S430 chip. There are no such discrepancies in older versions of GeekBench (3.7 and 4.0), so we can only speculate there's some sort of incompatibility between phone and benchmark. There's nothing alarming in Antutu, where the numbers are as you'd expect them to be. The Redmi 4 with its Snapdragon 435 chip posts nearly identical scores as the Snapdragon 430-equipped phones - after all the SoCs are very similar. A lot of the other phones here sport the Mediatek MT6750 chip, and that one can't keep up with the S435. There's a Redmi 4 on top of this chart - the Prime with its Snapdragon 625 is in a different league, one where the Xperia XA1 with its Helio P20 is a better match. By the way, you can hover over the bars to see hardware info relevant to the respective benchmark - in case you missed this feature we introduced recently. We don't have a number for the Redmi 4 Prime in Basemark OS II 2.0, but the Xperia XA1 is in the lead - thanks, P20. The Snapdragon 435s and 430 are tightly packed, yet the Redmi 4 is among the better ones. There are also the Lenovo K6 Power and Asus Zenfone 3 Max that make the S430 look bad here. Graphics oriented benchmarks show that the Adreno 505 isn't a powerhouse - what else is new? That said, the 720p display resolution helps here, and despite the lack of much raw power, the Redmi 4 puts out respectable fps numbers - for its class, that is. Adreno 506 vs. Adreno 505 - what a difference 1 makes. Look at the Basemark X results where the 506 GPU of the Redmi 4 Prime significantly outperforms the 505 in the Redmi 4. The 4, on the other hand, beats all the S43x competition, if only just. Overall, a predictable showing from the Redmi 4 in the benchmark run - not a record breaker, but a dependable all-round performer. If anything, it inches ahead of most similarly equipped competitors. The Xiaomi Redmi 4 did very well with an active external amplifier, delivering above average loudness and perfectly clean output. Quite impressively, and even more so for its price range, the smartphone had virtually no degradation with a pair of headphones. The only affected reading was stereo crosstalk and even there the difference was tiny. Volume remained above average too, making this a really solid showing by the Redmi 4.